Here is a picture (a small Box Brownie holiday snap dated 1935 from my collection), showing two Worthing Tramocars’ on the Seafront of that West Sussex town. The rear of the two vehicles is a Shelvoke & Drewry "Freighter" chassis (No. 03:1059), with a Harrington B20R body. It was put into service in April 1930, given Fleet No.7, and had Registration Number PO 1748. It was issued Worthing Licence Plate 213. The front one of the two is not identifiable but is one of a later delivery, again with Harrington body, this time of B26R configuration. PO 1748 was numbered B82 in the Southdown Motor Services fleet, when the company was sold to that concern for £15,750 on 1st April 1938. Southdown withdrew it in April 1941 and it passed to H. Lane & Co (dealer) of Chelsea, London SW3, it finally ending its life with Clymping Caravans, near Littlehampton Sussex, date unknown. The Worthing Tramocar company was formed in 1924 by Walter Rowland Gates (41), a Londoner who returned to England from New Zealand, where he had operated a mineral water business. Residing at 141 Brighton Road he observed that elderly passengers were finding it difficult to board the high step platforms of the local Southdown buses, and, that no buses ran along the Sea Front. 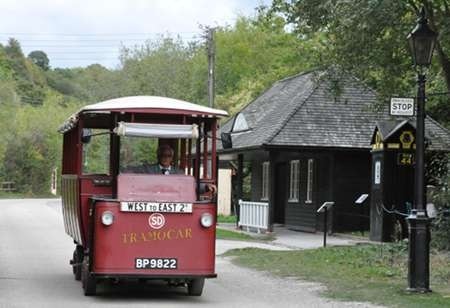 His answer was to apply for licences to run a service using vehicles designed with ‘low floors’ (nothing new in this world), and Mr Gates registered the name "Tramocar". For readers of this website who wish to learn more of this remarkable concern I would recommend ‘An Anthology of The Worthing Tramocar’, published by The Southdown Enthusiasts’ Club in July 2002. Oh what a fantastic period shot – and remarkably clear at that. History coming alive. Thanks for posting this remarkable view. I have looked at the flickr reference mentioned in the posting and adjacent in the "index" is a view of Amberley Museum’s example. I attach a further view of this device, during a rally in September 2009. It shows BP 9822 but the PSVC listing shows it to have started life as CV 784. The body it now carries was built in the Museum’s own workshops. I understand that the chassis was built for a dustcart. A wonderful period photo, full of action and people. How the sepia suits it and gives it the glow of a sunny day, which it appears to be, anyway. With all the flags and bunting out, what was being celebrated, I wonder. I love the jaunty angle of the motorbike’s exhaust! It was taken some time after August 1932, when the Ford Model Y (third car along) went into production. One thing I notice about the subject of the photo is that it has pneumatic tyres. Other photos I’ve seen always showed solid ones. I wonder if this part of Worthing seafront is still identifiable today? 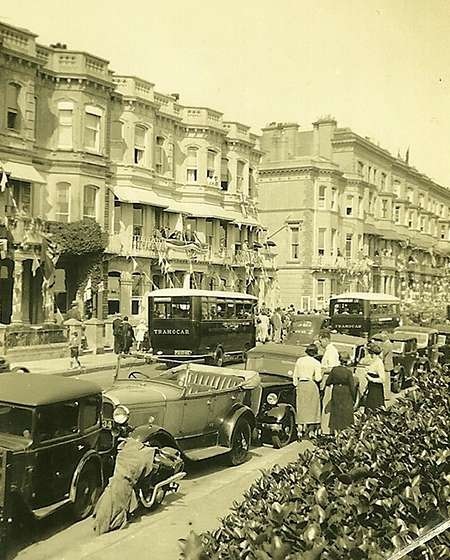 With the aid of Google Maps, I’ve been able to pin this photo down to Marine Parade, with the side turning (where the lone lower height building by the first bus is) being West Street. The buildings and view are the same, even to there still being a shrubbery on the right! The pier’s only a few hundred yards further along. As it’s 1935, the flags are probably for King George V’s silver jubilee. What a gem! Those really were "the days", especially for bus enthusiasts, as there was so much variety in both chassis and body supply, which created vast permutations of possibility. Our home resorts were thriving, and this photo captures the atmosphere of the time to perfection. Blackpool and Bournemouth Corporations also operated the S&D "Freighter", as did White Rose, at Rhyll, later Crosville, so it was a bit of a "seaside special", and they were very popular in their more common role as Dustbin carts! Tiny little wheels, solid tyred, I think, at least with the earlier models, and a tramway type "Tiller" control! Delightful is the word! My fathers uncle drove one of these S&D "Freighter" as a dustcart for Dewsbury Corporation.I remember my father telling me that they were steered by rods.I have a vague memory of riding on a Lincolnshire Road Car one at Skegness .I think that they had a Bedford front grill.I would have only been about 5 years old but I remember them being replaced by Bedford OBs with the nearside cut away.I think that one is in preservation. Although off-piste, it’s worth recording that S&D were almost wholly devoted to mundane war work for the duration of WWII. However, despite having no previous experience, they successfully developed and built 37ft miniature submarines, called the Wellfreighter. It was built for use by the Special Operations Executive, for the clandestine insertion and re-supply of agents behind enemy lines and suchlike! Amazing! Amazing what people and companies turned there hand to during the war – with a good deal of success, and probably not a single degree in sight!!! ………..but a great deal of accumulated knowledge and common-sense, David! That looks like some close parking by the c1928/30 Ford Model A Tourer squashed between the 1932 Austin 7 saloon and that Ford 8. As has been said, Worthing has not changed a great deal over the ensuing years. The name of Shelvoke and Drewry always reminds me of an old friend who worked as a motor mechanic for our local Council for a while and that included the hated job of working on S&D dustcarts. Any job was always such a nightmare of dirt and old rubbish so they were always referred to as working on "S— and Dust"! I’m sorry it’s so blunt but it takes me back to a smile from around thirty years ago! Am I dreaming, or did we have Seddon chassis with S & D equipment on Sheffield dust-carts at one time in the ’60s? Since we seem to be wandering off into the realms of dustcarts, now may be an appropriate time to comment on one we had in Lancaster in the late 1950’s. From what I can remember of it, it must have had an underfloor engine, because the dustbins were emptied into an area next to the driver (poor fellow!) and unloading was at the back end. It didn’t seem to last very long, and I can only assume that loading was too slow: one bin at a time rather than two at a time when loading at the back. Was it on a bus chassis, I wonder? There is certainly no mention in the Lancaster City Transport fleetlists of any single decker being rebodied after service as a dustcart, and I don’t recall any lorries of the period having underfloor engines! Crosville also ran some of these engaging vehicles in Rhyl. After the war S&D continued to produce dust carts and later fire engines. In the eighties an American firm Dempster Briothers took over the company, they were a major player in the US dustcart market and S&D built some front loading wagons using their Dumpster system they also built rear loading ones called Routechief. In the eighties Dempster pulled out and the remains of the company were bought by arch rivals Dennis. As a point of interest, the original Tramocar garage is still extant in Thorn Road (just along the seafront from this shot). It is now used as a Tyre fitters. The original S & D Freighters were later replaced, after the Southdown takeover, by Dennis Falcons with special low height Harrington bodies. I believe one of these (FUF 181?) still exists and is awaiting restoration. I seem to remember that S&D once built an airport bus that was used airside at Heathrow.Can anybody remember this? Hi Chris………..Should have said low floor rather than low height! This was to enable better access for Worthing’s elderly population. I have also made a faux pas with the garage in Thorn Road, as it now appears to have been converted into a private residence. The vehicles Philip Carlton remembers at Skegness were Vulcan VSDs dating from the 1920s. There were four of them – NR 6648, NR 7266, FU 5946 and FU 7549, which passed from Skegness Motor Services to Lincolnshire Roadcar in 1934. LRCC fitted the four buses concerned with Bedford petrol engines and radiators after the War and replaced them with Bedford OBs with converted Duple ‘Vista’ bodies during the late 1950s. There were four OBs concerned – HUO 692/LTA 752 ex Western National and ONO 88/89 ex Eastern National. 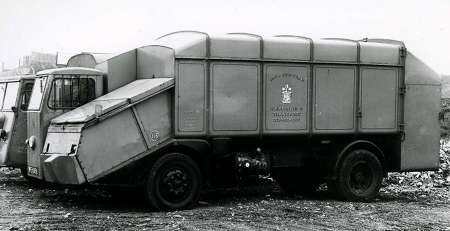 On 23.01.13 at 13.19 Peter Davis writes about a strange dustcart that he remembers from Lancaster in the 1950’s. I wonder whether it was a Dennis as in this picture? On 23.01.13 at 7.19 Chris Hebron termed S&D’s war work ‘mundane’. Not a very flattering term for war work that included producing 56,000 sprockets and wheels for tanks, tank transporter trailers, 45,000 exhaust pipe manifolds for landing craft etc.,as listed on my website. He then credits S&D with developing the Welfreighter miniature submersible! This was designed at S.O.E. Station IX at Welwyn Garden City under Colonel Dolphin. It’s true that S&D built the craft towards the end of the war so that they were never used in active service. This reflects the quality of the engineering expertise S&D had at their Letchworth Garden City works. The somewhat eccentric design of the SD Freighter was in fact the result of some very creative thinking between Harry Shelvoke and James Drewry. On 23.01.13 David Oldfield asked:- “Am I dreaming, or did we have Seddon chassis with S & D equipment on Sheffield dust-carts at one time in the ’60s?” As Secretary of the Shelvoke & Drewry Enthusiasts’ Club (www.shelvoke-drewry.co.uk ) I think it’s highly unlikely. A possible explanation is the confusion caused by S&D utilising modified Motor Panels cabs for their ‘N’; series of vehicles at a time when Seddon also used Motor Panels cabs. Or more likely as Seddons were more often seen as SAM’s (Seddon Allen Municipals ) with Jack Allen Colectomatic bodies based on the American Heil design.these are the dustcarts David remembers. On 25.01.13 at 6.53 Philip Carlton starts a discussion about SD’s Airport bus. Only one was ever built. The chassis was shown at the 1980 Motor Show at Birmingham and the British Airport Authority ordered one with bodywork by Reeve Burgess. It was placed in service at Gatwick Airport on car park passenger duties but by 1983 had been relocated to Heathrow for internal staff transport. Details from David Kaye writing in Buses Extra No. 49 October 1987. This issue also carries a lot more detail about SD’s as buses. 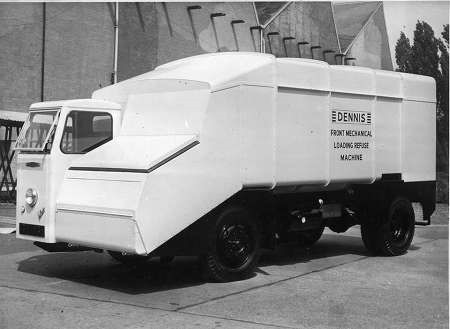 Thank you, Brian, for posting the photo of the Dennis dustcart. THe outline is much as I remember the one in Lancaster, but whether it was a Dennis is another matter! I’m pretty sure it must have been a Dennis if it looks much like the one Peter Davis [writing 24.04.17 at 7.12] remembers in Lancaster. It wasn’t a very clever design as the driver was situated right next to where the refuse was loaded into the vehicle. A full day’s work with the smells and the dust wouldn’t exactly make it an attractive job. Here’s a photo of it as a demonstrator. The loaders travelled in a strange compartment at the rear of the vehicle.